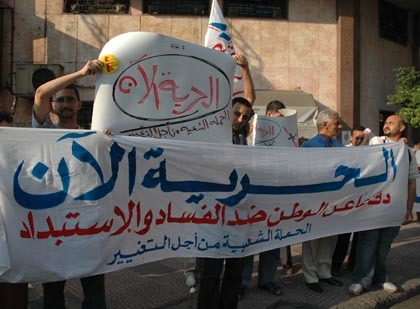 Yesterday, The Hamla Sha'biya min Agl al-Tagheer (The Popular Campaign for Change) held a demonstration in the Rud al-Farag section of Shubra (Northern Cairo). Pictures of this protest are available here. For reasons beyond my control, I don't have much time to blog. My band of friends arrived in Duran Shubra (Metro Station: Rud al-Farag) about 15 minutes before the protesters came. There were security trucks packing away the metal barricades that are used to contain protesters into trucks and disappearing. Around 6pm, the protest began. It was strange that there was no police presence except for the helpless traffic cops. Anti-regime protesters (around 300) chanted passionately for about 20 minutes or so. Then, the decision was taken to march down Shubra Street. It was exciting and odd to be marching down the street listening to the chants as everyone half-peered ahead looking for al-Amn al-Dawla to show up. Instead, a group of Mubarak supporters (all men, about 150 of them) showed-up on the other sidewalk without signs, started their angry chants, and looked menacingly towards the Popular Campaign protesters. They were being rude. Beyond calling the anti-government demonstrators "traitors" and screaming about how they were not "real Egyptians", there were several other more foul chants not worthy of being recorded. Similarly, they were chanting against Ayman Nor. The anti-Nor slogans were anti-semitic. As with the last protest, the pro-Mubarak gang looked possessed. The anti-Mubarak protesters had the usual "Down with Mubarak" chants supplemented with the "ya Ashreen Geenah, Be'ulu Eh?" (Hey 20 LE, what are you saying? -implying the Mubarak supporters are paid to be there) and "Give Mubarak a visa and Take him with you Condi". It was interesting listening to what the people in Shubra were saying. Most were in shock and asked "Who are these people? They want to destroy the country". The absence of security, however, allowed anti-regime activists to mix and mingle with ordinary citizens and explain their anti-regime program. In the case of previous protests, there has been a pattern of keeping citizens passing-by separated from the demonstrators. Whether this strategy works or not remains to be seen. There were a couple times I thought we would see a fight but each time things were de-escalated quickly. In fact on the way back to the metro as the demo was finishing, Pro and Anti- Mubarak demonstrators returned together jawing back and forth. At the post-protest festivities - many activists, academics, journalists, photographers, and observers debated the meaning of the lack of security. Three major theories surfaced as of last night. 1) It was "the Condi effect". The regime did not want to look bad in the aftermath of Condi's little democracy lecture and visit this week. (I don't buy this). 2) The regime thought that the people of Shubra and the pro-Mubarak gang would attack and beat the anti-Mubarak protesters so if the police were not there, the regime would not be blamed. (I don't buy this either - it seems like a major shift in security's modus operandi). 3) That having all that security around peaceful protesters just does not look good. It is 300 people and there are security trucks waiting in the wings should hell break loose. (This is one that appeals to my logic although I am not saying this is correct). One of the key young organizers laughingly explained that the unexpected lack of security was "like meeting a date and finding that the partner is a no show." Next week is a busy week in Egypt. Sunday - there is a demo against Torture in Lazoughly (where State Security has been accused of torturing people according to unverified complaints received by the National Council of Human Rights). Tuesday - Ayman Nor's has his preliminary hearing at the courts near Bab al-Khalq (or so Gamila Isamil told me last Sunday). Wednesday - Kifaya, the Hamla, Youth for Change, and the internet based group that argues it is independent and has no name take the touring demonstrations to Zayton near Masr al-Gadida. The Zayton site will be near a church to counterbalance the demo held at Sayida last week. But, as several of the organizers told me, this is a national movement that equally includes Muslims and Copts.